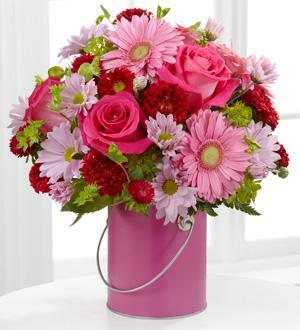 The Color Your Day With Happiness™ Bouquet by FTD® blooms with blushing sweetness to offer your special recipient a gift of charming cheer. 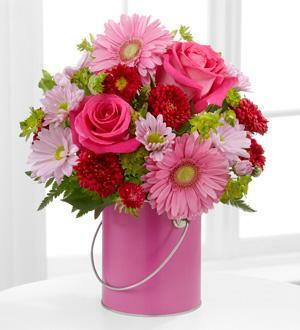 Fuchsia roses, pink gerbera daisies, lavender traditional daisies, red matsumoto asters, bupleurum and lush greens create a remarkable display arranged within a bold pink quart size decorative paint can inspired vase to make this a gift that will add to the joy and loveliness of thier day. GOOD bouquet includes 9 stems. Approximately 11"H x 10"W.
BETTER bouquet includes 14 stems. 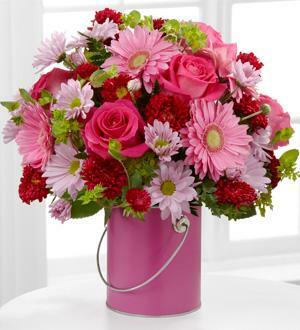 Approximately 12"H x 12"W.
BEST bouquet includes 19 stems. Approximately 13"H x 13"W.